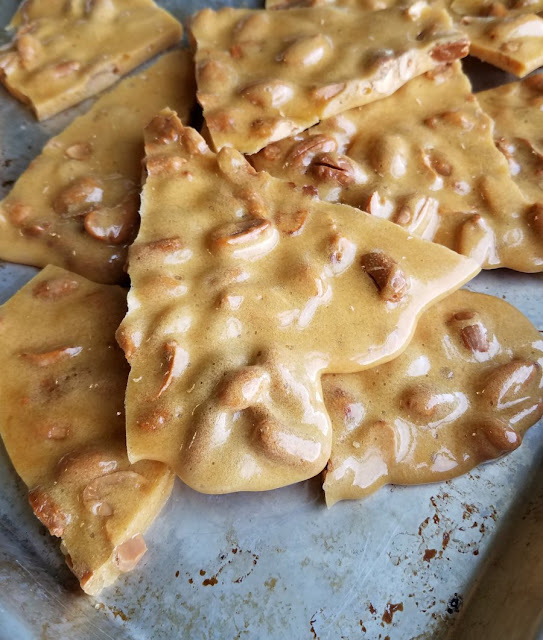 Sweet, crunchy peanut brittle is a classic candy that you can easily make at home. This updated recipe doesn't involve a candy thermometer, just a microwave. Make some asap! If you enjoy the sweet, caramelly crunch of peanut brittle you are not alone. It is a classic candy for a reason. But did you know you can make it in just a few minutes with a few ingredients in the microwave? You don't need a candy thermometer or any fancy equipment. So gather up the ingredients and lets make a batch! This is always one of our favorite Christmas candies. MiMi says this recipe was in the book that came with their very first microwave back in the '80s and it has been a staple ever since. She never likes doing anything that requires a candy thermometer, so this is the perfect kind of candy recipe for her. It seems like this one is really a favorite treat of my brother Clint and Paw-Paw. We all love it, but those two go crazy for it! Luckily it really doesn't get any easier to make than this. It starts by making a simple sugar syrup of sugar and corn syrup. Once it is all hot and bubbly, you stir in the peanuts and let it cook a bit more. It starts getting a little caramelized at this stage and the peanuts get toasty. Stir in just a bit of butter and vanilla and let it cook to caramelized goodness. When it is golden and delicious, you stir in some baking soda. Have you ever stirred baking soda into a hot sugar mixture like that? We also do it when we make caramel corn. It bubbles up big, so you want to make sure to have an oversized bowl. But all of that air is what makes it crunchy but light instead of a solid sheet of lollipop textured break your teeth hardness. So just be careful, as the hot bubbly sugar could definitely get your fingers or make a mess. But if you size your bowl correctly, it shouldn't be a big deal at all. Then just pour the mixture onto a greased baking sheet and let it cool. Break it into pieces and store it in an airtight container to enjoy at your leisure. You could also bag some up as gifts, people will think you went all out making them such a tasty treat! In a 1 1/2 quart bowl (MiMi and I both always make it in our 8 cup glass measuring cups) stir together sugar and syrup. Microwave on high for 4 minutes. 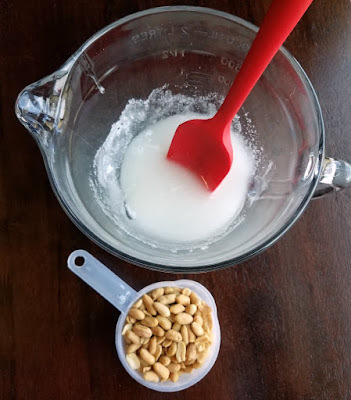 Stir in peanuts. Microwave on high 3 to 5 minutes, until it starts getting golden brown. Add butter and vanilla to syrup, blending well. Microwave on high 1 to 2 minutes more. Peanuts will be lightly browned and syrup very hot. Add baking soda and gently stir until light and foamy. Pour mixture onto a lightly greased cookie sheet. Let cool 1/2 to 1 hour. When cool, break into small pieces and store in air-tight container. Wow - this sounds so easy compared to the stovetop version I have made. I'm definitely trying this next time! Pinned! I have never done it stove top because this is the way I always saw my mom make it. I feel like I should try it that way sometime for experience sake, but this way is so easy! This recipe looks like a keeper. I'm with Mimi when it comes to not using a candy thermometer if possible. That is funny that she got this recipe with her first microwave! Thanks for sharing. I need to try this. This definitely makes it foolproof and I love that she's had the recipe that long too! Thanks, Amy! This is a great recipe! So much easier! Sooooo easy and delicious too! Thanks, Amy! 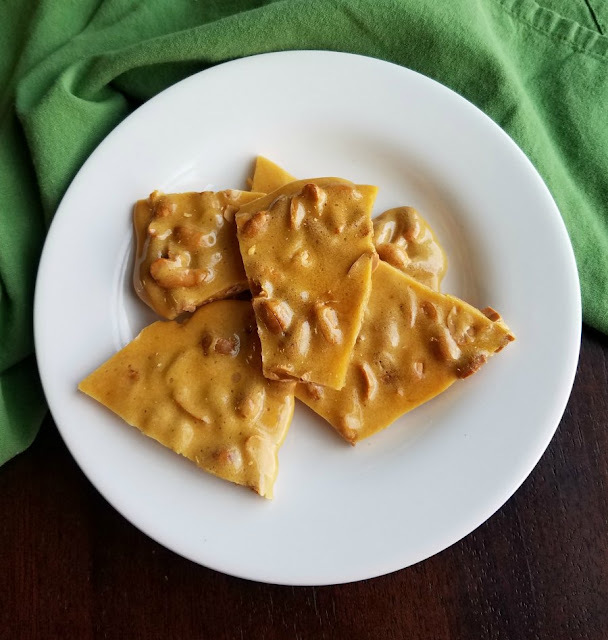 Your Peanut brittle looks delicious, we just love brittle and this very special treat! Wishing you a very Merry Christmas and thanks so much for sharing your awesome post with us at Full Plate Thursday! It is definitely a Christmastime must. Thanks! These sound so good! I definitely need to try it! It is so good and easy too!